Delighted to bring you another Friday round of inspiration at Power Poppy! Earlier this week Marcy released a gorgeous new digi called Everything’s Rosy, and today I’m excited to show it to you! It’s perfect for our Valentine season coming up, but also for any day you want to send a really LOVELY card. I printed the image on my go-to for digis - XPress it Blending card stock and then found a stash of paper I’d want to pair it with. This one was from My Mind’s Eye - Market. I just love the peachy and cream tones. Because we’re in a TALL theme this month with our Power and Spark Challenge, I chose again to do a tall card design, only on the horizontal. Sigh...aren’t these roses just beautiful? And I just love the cups too! I used a stitched die and my machine to stitch all around the design as well. The rosy trim was perfect and I finished it off with little wood veneer hearts. Here’s the inside of the design showing off a sentiment from this digi set. Perfect for an any-day sort of design. Here’s the Bloom Brigade Sisterhood in action today! Pop on by, I know you’ll be inspired! Christine, this is absolutely gorgeous! Your coloring is always exquisite, and I love the layout with this beautiful paper and the tall "on its side" card! Beautifully finished with the stitching and the sweet little wooden hearts and the rosy trim. Beautiful inside as well. Yes, this is definitely one of my favorites and one I shall use a lot (and can't wait to play more with it be cropping it too). Hugs, sweet friend, and keep warm!! Beautiful is right. Your blooms look wonderful Christine. I like the vintage (so I think) feel of this from the papers, colors and the roset mesh you added. Beautiful card. Sweet perfection, Christine! Anyone receiving this card would feel very, very special. Such a lovely, romantic look to your roses with the colors and papers you chose. Wonderful design for a tall/long card. So pretty inside, too. Love how you shaded the sentiment flag. This is so gorgeous. Love the pretty flowers. Woah... you have paired this all up perfectly as usual Christine! 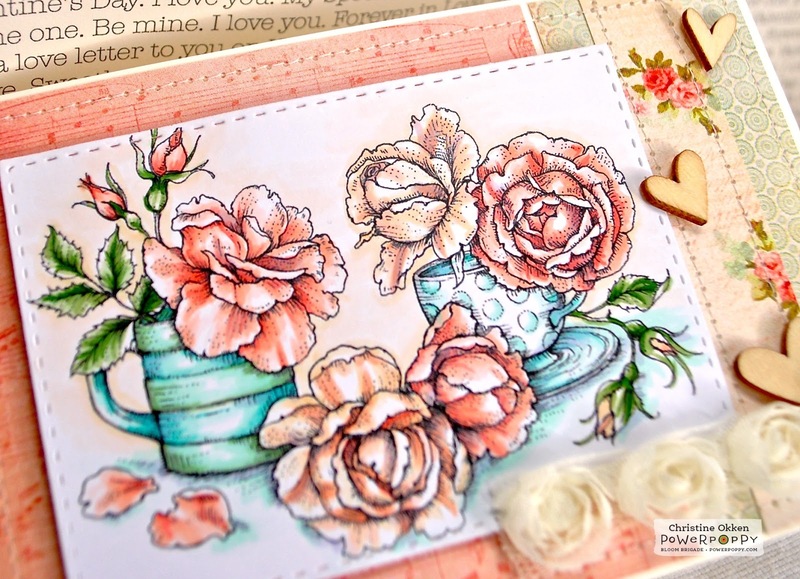 Not only is your coloring to die for, your paper and embellishments just make it all sing! True beauty sweet lady! What a beautiful card. I love these colors and the way you shaded the flowers. Christine this card is absolutely stunning. The colours and the composition are perfect. Cheers. I agree this is gorgeous! Beautiful colors and coloring! 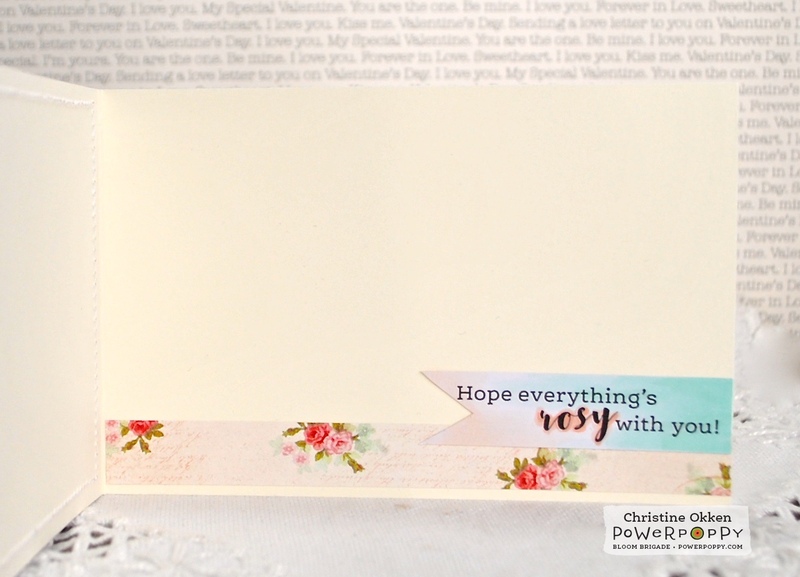 Ah, Christine, a melt-my-heart, gorgeously-soft card. Beautiful, and such pretty shading in those amazing roses! Thanks for sharing your techniques! 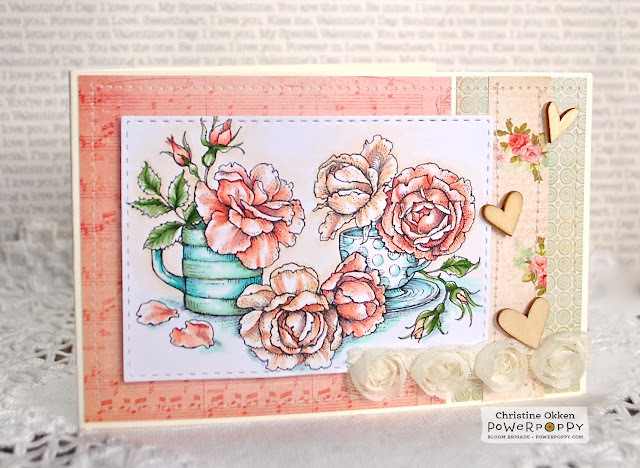 What a beautiful, elegant, and soft color palette Christine! I adore how you colored this, and your embellishments just put it over the top! LOVELY!! Beautifully colored, I too love the peachy colors and mixed with the blue is so pretty, lovely papers to go with it all too!